Richmond’s Not Having It! No Scooters in RVA says the City…For Now At Least! Bird, a Santa Monica, California-based company that operates a fleet of electric dockless scooters in cities nationwide, on Thursday dropped a batch of its vehicles in the city in a blitz that quickly resulted in riders zipping around town. But operations didn’t last long, as by Thursday afternoon the city announced Bird was not allowed to run in Richmond and its scooters were being impounded. Tom Byrnes, a spokesman for the mayor’s office, confirmed that the city was collecting and impounding the scooters, saying that Bird did not have the permissions needed to drop their fleet in the city. A screenshot of Bird’s iPhone app and the location of its scooters in Richmond on Thursday. Here’s how Bird works: Users can locate and unlock a scooter for $1 through the company’s mobile app, then ride it for about 20 cents per minute. The scooters are dockless, meaning they can be left anywhere after use. In addition to riders using them, the scooters were seen parking on sidewalks across the city on Thursday. Byrnes said Bird was in violation of the Department of Public Works’ encroachment policies relating to placing things in the public right-of-way, as well as safety and liability policies. “They’ve been informed that the city is removing (the scooters). They’ll have opportunity to pick them up tomorrow at a location they were given,” Byrnes said. 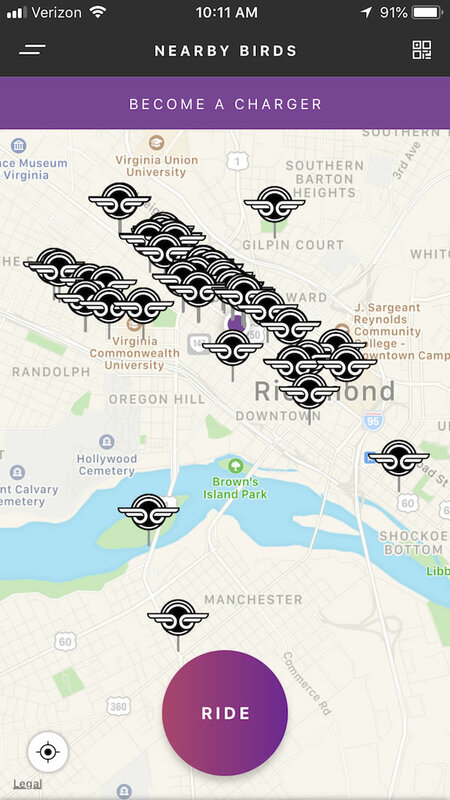 It’s unclear exactly how many Bird scooters were sent to Richmond, but its app showed dozens pinging between downtown and VCU early on Thursday. Bird’s arrival came weeks after one of its main competitors, Lime, began exploring Richmond as a potential market. 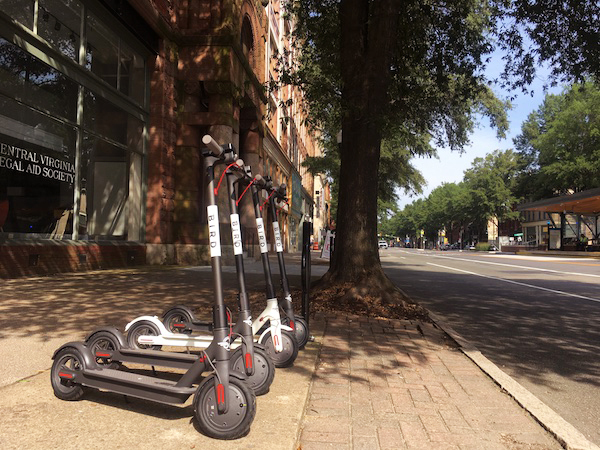 Bird spokeswoman Mackenzie Long said the company launched in Richmond as part of a “university pop-up tour,” on which it is dropping its scooters into the vicinity of 150 colleges and universities. Long did not respond to requests for comment regarding the shut-down by press time. Long did not say whether the Birds plan to be fixture in Richmond long-term. The company does have a message in its app saying it’s seeking to hire “chargers,” people who collect and charge the scooters. Bird has shown a propensity for sudden, overnight launches in cities it enters, having done so in Cincinnati, Austin and St. Louis, as well as in its home city of Santa Monica. Its sudden arrivals have left municipalities wondering if and how to regulate such companies. Some cities have required special permits and that the scooters be kept in designated areas, while others have banned them outright. Byrnes said he’s unsure if a permit process that would precisely allow Bird to operate already exists in Richmond code, but that the onus is on Bird to put forth an application to operate. Richmond Councilwoman Kim Gray said City Council was unaware of Bird’s pending arrival, but added that as early as mid-morning Thursday, she’d heard from constituents that are concerned about the scooters clogging sidewalks. Gray said she is planning to introduce some sort of ordinance regarding regulation of the scooters at council’s next meeting in September. “I’m for positive modes of transportation, but if they impede on pedestrians and people in wheelchairs and make our sidewalks inaccessible … we have enough accessibility challenges as it is,” Gray said. Founded in 2017, Bird operates in 29 markets domestically as well as in Paris. It has raised $415 million in venture funding, according to startup database Crunchbase. Lime is in over 60 markets nationwide. In addition to competing against one another, Bird and Lime also would potentially draw business away from RVA Bike Share, the city’s docked-bike service. There’s also locally run Kul Wheels, an e-bike rental service that operates out of Rockett’s Landing.